It’s not for your pancakes! Do you remember those Jif adverts when you were a kid? They were proper public service announcements weren’t they? Lemslip shower butter cream (£2.50 for 100g) from Lush has been given a makeover. Lush’s butter creams are now more solid, similar to our soap, so easier to use in the shower and needing less packaging. Lemslip contains fresh lemon juice, lime oil and sweet orange oil. This one will awaken the senses and effectively cleanse dull skin. Cocoa butter moisturises the skin, along with extra virgin coconut oil. I love lemon things… food-scented things in general if I’m honest. Mint, Ginger, Bubblegum… all a big hit with me. I think this is more for oily skins, thanks to the antibacterial properties of those citrus oils. I haven’t tried these Shower Butter Creams, but I do like the LUSH Shower Jellies. I don’t think you can put it on your pancakes though. Have you tried this or the other Butter Creams? I’m kind of a LUSH n00b! I don’t like the butter creams much, I’m not at all keen on the consistency and I struggle to get a lather (which I know isn’t necessary for cleaning but I like it!) but they are super popular so it’s probably just me! 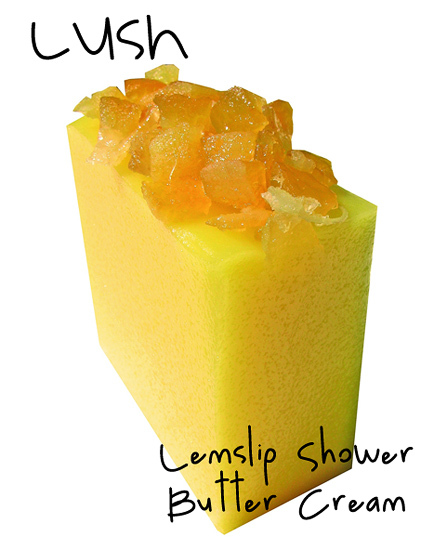 This was the first Lush thing I ever tried in like… 2002 or something. And it remains to be one of the only things I would ever repurchase. It’s nice, especially if you keep it in the fridge in the summer – really refreshing. I can’t use shower or bath products cos of my allergies but this is one of the ones I would definitely use if I could, i smelled it in the shop and it smells so delicious. Meh I will make do with the scrubs creams, although my mint julep scrub literally burned my lips yesterday, not sure if it was it or me getting carried away scrubbing! Moving on ….have you tried Spice Curls? Spicy and I suppose it must have some lemon in it? I like the balms too. Flying Fox in a pot. And those solid shampoos. This reminds me I have about 5 empty silver Lush tins. If I weren’t spending so much on polishes I could afford Lush…. I tried the more squishy version and was so dissappointed as they made a mess of the bath. But now that they are harder id give them another go! I loovvee the smell of lemslip but not crazy about the price! This looks delicious, I haven’t tried any of them but really want to now! OMG I can’t wait until pancake day! Cor!!! That shower btter thingy sounds lovely! I’ve had a few things from luch, i can take them or leave them tbh- but the smell is always lovely. I haven’t tried the butter creams but i really want the chocolatey one. Like you i’m a HUGE fan of food-smelling things, lots of people dislike them, but i think it’s great to smell like a big strawberry cream cake or something. 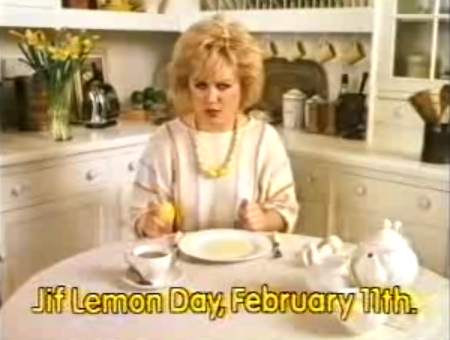 And i’m so looking forward to Jif Lemon Day, i always make a huge pig of myself.